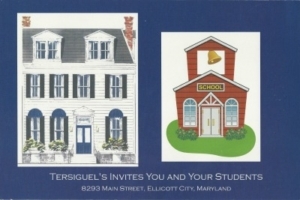 Our family and the staff here at Tersiguel’s would like to invite you to visit us in Historic Ellicott City. The program will be both fun and educational, and generally takes place on Thursdays. Fernand will share with the students his family heritage, and experiences growing up in Brittany, France. After lunch, the students will have the opportunity to ask Fernand questions about his life, and our restaurant. The meal is served with juice and bread. Any dietary restrictions can be arranged at the time of the reservation. The students will also enjoy a demonstration of Crepes Suzette; there will be enough to sample. Please contact us at 410-465-4004 to make reservations. We look forward to seeing you this coming 2018-2109 school year. Please note, Chef is modifying the previous menu because of the overwhelming dietary restrictions we have received regarding meat. Please update your permission slips accordingly! We can’t wait for your return to Tersiguel’s and Ellicott City!